The very best delis in Colorado sure can stand up to East Coast competition in terms of quality ingredients, and authentic and new-age menu items. From delicious corned beef to loaves of bread made from scratch, these delis are top notch and strive to dish out strictly house-made delights. No matter if you seek the perfect Jewish eatery, Italian spot or something in between, these 10 best delis in Colorado are sure to please the sandwich lover. Find classic sandwiches and salads with a modern twist at the Masterpiece Delicatessen in Denver. Masterpiece strives to make everything in-house. But when they can’t, it’s bought from local businesses. Try a classic deli favorite like the Reuben or if you’re in for breakfast, taste the award-winning breakfast sandwich on an onion bagel known as the Taylor Pork Roll. This family-owned Italian deli has been serving deli favorites since 1987. Located in Colorado Springs, Mollica’s Italian Market & Deli produces its meat in-house, including sausage and meatballs. For fresh food and Italian gifts and wine, head to Mollica’s for your Italian deli fix. This old-fashioned sandwich shop and deli features ingredients from local suppliers for its award-winning sandwiches. Choose from over 120 ingredients to pick from for the perfect sandwich. D’Deli makes classic sandwich favorites but also serves unique, yet totally Colorado, protein options like smoked elk. The Bagel Deli and Restaurant is a local favorite and for good reason. Step into the Bagel Deli and you’d think you just stepped into an authentic New York deli. The massive Reuben sandwich is worth the wait at the restaurant. However, breakfast food, which is served all day, is a great option here. The challah French toast comes highly recommended. Or go back to the breakfast deli classics with salami and eggs. This Italian deli in Denver has been serving hungry customers since 1994. Don’t just only grab a sandwich but also a home cooked-style meal, hot and ready for takeout. Mimicked from East Coast Italian delis, top your salami sandwich with Spinelli’s marinated veggies. Also, if you want your own home cooked meals to taste like Spinelli's, hit up the small grocery section for olive oils, fresh breads and other Italian groceries. Valente’s has been run by the same family for three generations now. Operating since 1953, Valente’s offers a wonderfully large selection of imported Italian foods, like sauces, olive oils and pasta. There is an in-house bakery, coffee bar, meat market and of course a sandwich shop. Valente’s may be known for many things, such as great meatballs or 16 different breads and 20 types of cookies and desserts, but it’s definitely known for great handmade Italian food. You’ll be able to find your favorite Italian brand in the market or discover your favorite sandwich at the deli counter. This family-owned deli offers hearty meals for breakfast, lunch and dinner. Get more than just a sandwich here. But if you do get a sandwich make sure it's hot pastrami on rye! Founded in 1985, this Denver deli offers traditional deli sandwiches, like corned beef and kosher salami, along with numerous other offers like chocolate cake or matzah balls and chicken. Find organic bread in Avon Bakery and Deli’s delicious sandwiches. This deli’s organic bread is made from organic flours milled right here in Colorado. It might be hard to bake at the high elevation found in the city of Avon, but Avon Bakery and Deli makes it seem easy to make the perfect loaf at 7,420 feet. Rosenberg’s Bagels and Delicatessen will make any New Yorker feel right at home. With a large variety of bagels, cream cheeses, meats and cheeses, create your perfect breakfast bagels or bagel sandwich. 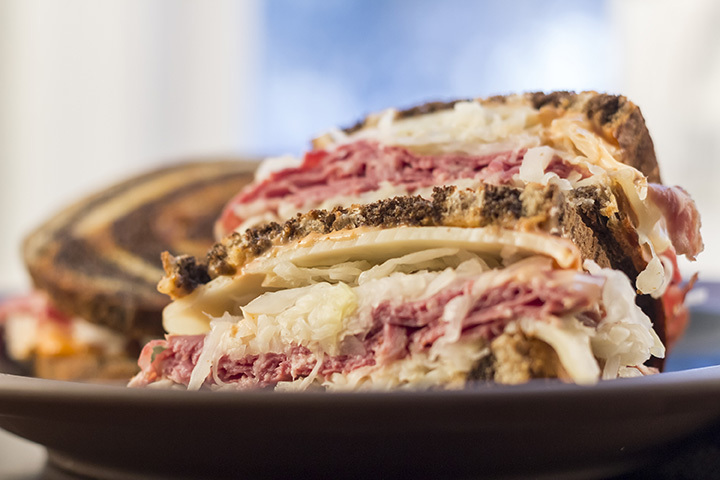 Try the house-made corned beef on pumpernickel—you won’t regret it. Wooglin’s Deli and Cafe serves breakfast, lunch and dinner in the heart of Colorado Springs. There is a wide variety of food on the menu, so everyone will be able to find something to enjoy at Wooglin’s, from quesadillas to filling sandwiches. The muffins, quiches and other desserts are made in-house from scratch.